Jake Elliott is an American football player who began his professional career in 2017. He plays as a placekicker for the Philadelphia Eagles of the National Football League (NFL) and like most other footballers, Jake had been involved in other kinds of sports before he finally settled for football. Earlier in his youthful days, Jake played baseball, basketball, and tennis, excelling in them all especially tennis for which he was considered to be one of the best players in the state. He, however, gave up all the other sports to build a career in football while he was in high school. 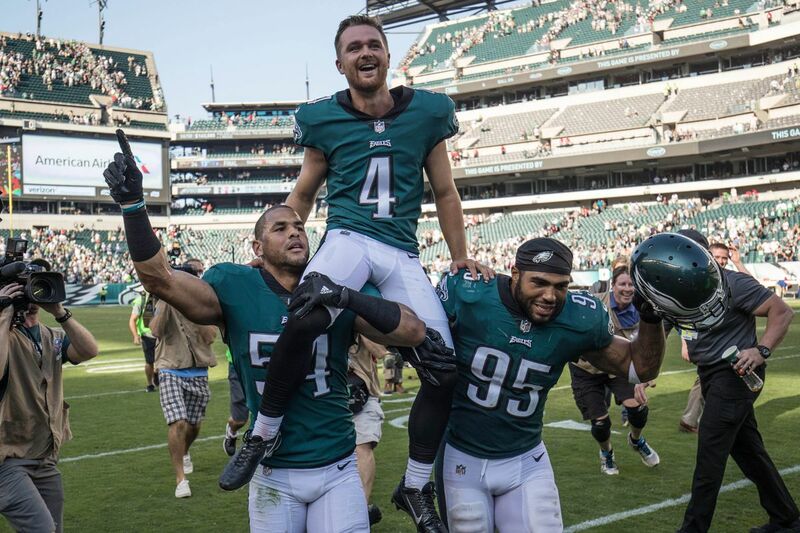 Bio – Who Is Jake Elliott, The NFL Placekicker? Jake Elliott was born on January 21, 1995, in Western Springs, Illinois. The kicker whose full name is Jake Daniel Elliott was born to Diane Stoub and Bruce Elliot. He attended Lyons Township High School, La Grange, Illinois, where he played tennis for three years until his football talent was noticed by a Lyons assistant coach during a Homecoming student field goal kicking contest. Before his junior-year season, Jake Elliott was an ESPNHS underclass and named First-Team All-State by the Chicago Tribune. While playing in his junior season, the talented placekicker made a whopping 52-yard field goal during a game between his school and Oak-Park River Forest High School. He was named Second-Team kicker for Kohl’s All America List after he made 15 of 21 field-goal attempts during his senior year season. Subsequently, at the completion of his high school education, the young champion decided to move on to the University of Memphis which offered him a full scholarship. There, he played college football with the Memphis Tigers from 2013–2016 under head coaches Justin Fuente, Darrell Dickey, and Mike Norvell. During his first year in college, Jake Elliott was named the starting kicker at the end of summer training. He played so well while with the team that he broke the record of 53 yards field goal set by Stephen Gostkowski in 2005 and setting a new one with his 56-yard at USF. Elliott’s amazing performance earned him the American Athletic Conference Special Teams Player of the Week award. He was also named “Star of the Week” by Lou Groza Award alongside other two payers. By his second year, Jake led the American Athletic Conference by an average of 9.2 points per game and as a result, was named First Team All-Conference and Conference Special Teams Player of the Year for the second consecutive year. In 2014, Jake Elliott kicked a 54-yard field goal at the Miami Beach Bowl which sent the game into a second overtime and subsequently led to a 55-48 victory. This was one of his high moments during his college career because the 54-yard kick was the fourth-longest field goal in the history of bowling game. He led the conference in the 2015 season with his 63 extra points and 23 field goals while in 2016, he had 21 field goals tie with Tulsa’s Redford Jones for the conference lead. Jake converted all 202 extra point attempts and 81 of 104 field goal attempts during his football career with the Memphis Tigers. Following his successful college career, the placekicker took the first position in total points, extra points, and field goals in addition to finishing third in field goal percentage in conference history. In 2017, Elliott entered the 2017 NFL Draft and was selected by the Cincinnati Bengals in the fifth round. He was the 153rd player to be picked overall and the first of three kickers. Unfortunately, he was waived and re-signed to the practice squad the following day after he competed with Randy Bullock for the kicker spot and lost. However, Jake Elliott was signed off from Cincinnati Bengals after Caleb Sturgis, the Eagles’ starting kicker, was placed on injured reserve. He made his first NFL appearance in the second week of the 2017 season against the Kansas City Chiefs and has continually put up solid performances in all his games which have earned him several NFL and Eagles Franchise records. Behind every successful man, they say, is a woman. Jake Elliott may not be married at the moment but he is said to be in a relationship with Ari Kowalski, an utterly stunning lady from Western Springs, Illinois. She attended Indiana University from where she bagged a Bachelor’s Degree of Science in Kinesiology, Management, and Sports Management. Footballers are usually tall and Jake is not an exception. He measures 5 feet 9 inches in height (1.75 meters) and weighs 170 lb (77 kg). He also has blond hair and a beautiful set of green eyes.